Along with writing two popular series, Elly Griffiths has decided that it is time to add a stand-alone psychological suspense novel to her repertoire. That novel is The Stranger Diaries and is currently available overseas and will appear in the States early next year. As with her previous work, this meticulously structured novel features some indelible characters, a vividly-depicted setting, and a strong fair-play mystery. Readers may remember A. S. Byatt’s Possession, a novel in which the author crafted “fake” Victorian poems as part of a complex plot. 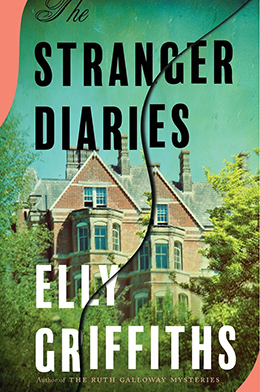 Similarly in The Stranger Diaries, Elly Griffiths has created a fictitious Victorian-era author by the name of R. M. Holland, along with his most celebrated short story, The Stranger. Excerpts from that Gothic horror story interrupt the main narrative and the complete story is provided at the conclusion of the novel as a sort of coda. As The Stranger Diaries begins, Clare Cassidy is teaching a summer creative writing course to adults at Talgarth High, an exclusive educational institution comprised of multiple buildings across a larger campus in Sussex. The Old Building – also known as Holland House – has historical connections to R. M. Holland, about whom Clare is a celebrated scholar. She teaches his most famous story, The Stranger, to her students all while working on a non-fiction manuscript about Holland’s life. Clare’s teen daughter, Georgia, lives with her and has a collection of friends culled from the other students in the main high school. Less than ten pages into The Stranger Diaries, readers discover that one of the other English teachers has been murdered. This brings the authorities to the steps of Holland House. Leading the charge is DS Harbinder Kaur, one of the most refreshing new characters in crime fiction this year. Harbinder is an Indian Sikh lesbian in her mid-thirties who still lives at home with her parents. While she is good at her job, she has little interest in placating people – especially suspects – and could probably use a training course in delegation. While The Stranger Diaries is clearly a stand-alone novel, readers will hope that the fascinating Harbinder makes some future appearances in other works. The titular diaries are multitudinous. Clare keeps a hand-written diary every day and has a collection of notebooks that trace her life in minute detail stored in her study. Her daughter and many of the other students often write in cyberspace on a website called MySecretDiary.com – a place where they can gossip in anonymity. Things turn decidedly eerie when new messages begin to appear in Clare’s diary in handwriting no one recognizes. These messages seem to be taunting Clare and the police, while also providing some clues to the murder – or murders, as ends up being the case. The novel is told from several perspectives – Clare’s, Harbinder’s, and Georgia’s, plus Clare’s diary and Holland’s short story. These points of view weave in and out of each other, sometimes giving readers multiple angles of the same events. Rather than being confusing, this method of discombobulating the reader only adds to the air of mystery and Gothic that permeates The Stranger Diaries. The academic setting of the novel allows Elly Griffiths to incorporate many erudite references to literature. Readers familiar with those works mentioned will feel an added connection to the proceedings, nodding knowingly at the various allusions. But never wanting to get too heavy-handed, Griffiths also has a recurring theme in which virtually everyone in the book is addicted to Strictly Come Dancing – several of them using the television show as an alibi. Another recurring motif is the phrase “Hell is empty.” Just try to convince me that is not creepy. 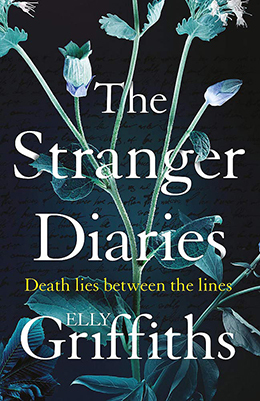 All in all, Elly Griffths’ The Stranger Diaries is a delightful reading experience and one that many readers will cherish for years to come.